Honduras is the second largest country located on the Central American Isthmus and is bordered by Guatemala, El Salvador, and Nicaragua. To its North lies the Caribbean Sea and to the south the Pacific Ocean. According to the World Bank Honduras is the thirdpoorest country in Latin America and Caribbean region after Haiti and Nicaragua. Honduras covers an area of 112,090 km2, making it slightly larger than the state of Tennessee. The population of the country is approximately 6.5 million people; Spanish is the official language, although Honduras is a multicultural, multiethnic, and multilingual country. Nine ethnic groups account for 14.5 percent of the population. In Honduras, 82 percent of its territory is in slopes and land management is influenced by the presence of moderate (12-30 percent) to pronounced (>30 percent) inclines (IICA, 1999). Almost 53 percent of the population lives in rural areas (Banco Mundial, 2002), and more than 60 percent of the rural population lives in areas classified as slopes (PRONADERS, 2000). The average annual per capita income is $700 US annually, less than $2.00 US daily (Banco Mundial, 2002). Poverty is concentrated in the slopes, where 91 percent of the people subsist with less than $1.00 US daily (IFPRI-WUR-PRONADERS, 2003). It is estimated that of the 300,000 families that live on slopes, 93 percent are under the poverty line (PRONADERS, 2000). Honduras has three distinct physiographical regions: an extensive interior highland area and two narrow coastlands (http://hdl.loc.gov/loc.gdc/cntrystd.hn). The Interior Highlands, which constitutes of approximately 80 percent of the country’s terrain, is mountainous. The larger Caribbean lowlands in the north and the Pacific lowlands bordering the Golfo de Fonseca are characterized by alluvial plains. The Interior Highlands are rugged mountains and the land is difficult to traverse and equally difficult to cultivate. Scattered throughout the interior highlands are numerous flat-floored valleys, 300 to 900 meters in elevation. The floors of the larger valleys provide sufficient grass, shrubs, and dry woodland to support livestock and in some cases, commercial agriculture. Subsistence agriculture has been relegated to the slopes of the valleys. The Caribbean lowland, which most Hondurans call “the north coast”, consists of river valleys and coastal plains. The central part of the Caribbean lowlands, east of La Ceiba, is a narrow coastal plain only a few kilometers wide. It is in this portion of the North Coast that the proposed study site is located. To the east and west of this section, however, the Caribbean lowlands widen and in places extend inland a considerable distance along broad river valleys. The broadest river valley along the Rio Ulua near the Guatemalan border is Honduras’s most developed area. To the east, near the Nicaragua border, the Caribbean lowlands broaden to an extensive area known as the Mosquita. This area consists of inland savannah with swamps and mangrove forests near the coast. 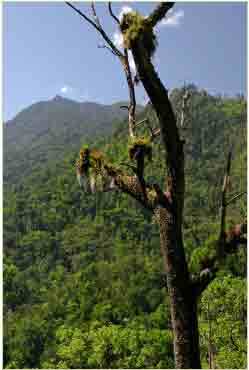 The last and smallest physiographic region of Honduras is the Pacific lowland. This is a strip of land averaging twenty-five kilometers wide on the north shore of the Golfo de Fonseca. The land is flat, becoming swampy near the shores of the gulf, and is composed mostly of alluvial soils washed down from the mountains.